A press conference was held on Tuesday, Feb. 5 at the Flint Public Library to officially announce the 2019 inductees to the Greater Flint African American Sports Hall of Fame. 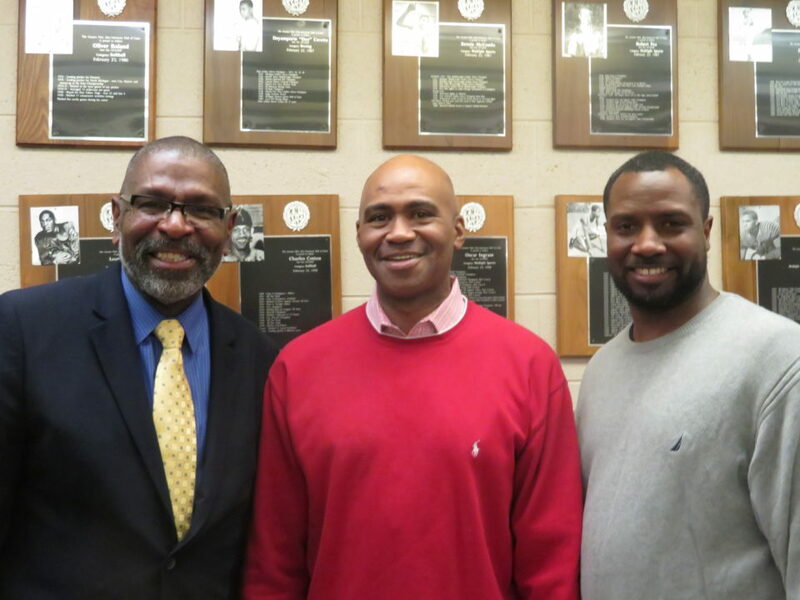 The new inductees are Darryl Johnson, Todd Lyght, Deanna Nolan, Morris Peterson, MaliVai Washington, Andre Weathers, 1978-81 Flint Northern Girls Basketball Team, and 1974 Flint Northern Boys’ Cross-Country Track Team. Flint is known for producing top athletes. This group is no exception. It includes a Super Bowl champion, a three-time WNBA champion, NCAA basketball champion, and a Wimbledon finalist among the six individuals and two teams inducted. Darryl Johnson grew up playing basketball at Jackson Park on the north side of Flint. He went on to win three state championships from 1981-83 at Central High School. Johnson played for Michigan State from 1983-87. As a junior, he averaged 16.6 points a game. In his senior year, he led the team in scoring; averaging 22 points a game while being named Second Team All-Big Ten. Johnson was selected with the 12th overall pick in the third round of the 1987 NBA by the Golden State Warriors but actually played for the Cleveland Cavaliers 1995-96 NBA season. He played most of his professional career in the Continental Basketball Association and the World Basketball League ending his career playing in South America. Todd Lyght played football at Powers Catholic; where he was a star wide receiver and defensive back. He also served as team captain and ran track for three years. Lyght played college football at Norte Dame and was a two time All American in 1989 and 90. As a junior, in 1989, Lyght intercepted eight passes (two shies of the school record) and had 47 total tackles (27 solos). He ranked eighth in final NCAA standings in 1989 for interceptions and was a finalist for the Jim Thorpe Award. Lyght was a first-round pick, fifth overall of the St. Louis Rams in the 1991 draft. In 1999, Lyght earned his first Pro Bowl selection and was a first-team All-Pro. He helped the Rams win the 2000 Super Bowl. Lyght began a career in coaching in 2009 and in 2015, Lyght was hired by Norte Dame and is currently the defensive back coach. Deanna Nolan, also affectionately named “Tweety”, led the Flint Northern girl’s basketball team to back-to-back state championships in 1994-95. She was named Michigan’s Miss Basketball in 1995. Nolan played college basketball at the University of Georgia, and in 2001 she earned All-SEC Tournament Team honors in her senior year. In the 2001 WNBA draft, Nolan was selected by the Detroit Shock in the first round (sixth overall). Nolan helped the Shock win three championships. She was named WNBA Finals MVP in 2006 and was also named to the WNBA All-Star Team. During the off-season, she played for UMMC Ekaterinburg team in Russia. Morris Peterson played basketball at Flint Northwestern High School where he made All- City, All-Valley and All-State. He went on to play at Michigan State University where he helped the Spartans win the 2000 NCAA National Championship. Peterson, one of the famous Flintstones, went on to become an All American and Big Ten Player of the Year. Peterson was drafted by the Toronto Raptors in the first round and was named to the NBA’s All-Rookie First Team in 2000-01. He played eleven seasons in the NBA for Toronto, New Orleans, and Oklahoma City. Since returning to Flint, Peterson has initiated several philanthropic ventures. Through his Morris Peterson Jr. Foundation, Peterson started a back-to-school backpack program, a dental initiative in conjunction with the Michigan Dental Association to provide free access to dental services for low-income families; and the very popular Flintstones basketball camps. In January 2018, Peterson opened Mo Pete’s Sports Retreat sports and bar grill. MaliVai Washington attended Carmen-Ainsworth where he played tennis. He went on to play for the University of Michigan where he was the top-ranked college player in the United States at the end of his sophomore season. Washington turned professional in 1989 and won his first ATP singles title in 1992. MaliVai eventually won four ATP titles and reached the 1996 men’s singles finals at Wimbledon. In 1994 he created the MaliVai Washington Foundation based in Jacksonville, FL and in 2009 he was awarded the ATP Arthur Ashe Humanitarian of the Year Award for his positive work with young people. The foundation promotes academic achievement and positive life skills through the sport of tennis for students in kindergarten through high school. Andre Weathers played football at Central High where he was named All-State as a wide receiver/defensive back. Weathers was not only a high achiever in sports but in academic as well. He went on to play at Michigan where he earned a degree in engineering and helped the Wolverines win the 1997 national championship. Weathers was selected by the New York Giants in the sixth round of the 1999 NFL draft but his career was cut short due to knee injuries. After retiring from football, Weathers worked as a football coach at Central and Bentley High Schools. He is currently the head coach for the Flint Jaguars at Northwestern High School. Flint Northern Girls Basketball Team, led by Coach Dorthy Kukulka, won four straight Class A titles in 1978-81. They won 76 consecutive games – setting a state record. Key players on this record-setting roster included Pam and Paula McGee, Letitia Hughley, Judy Tucker, Lawanna Hughley, Theresa Anthony, and Felicia Cooper. In 1974 the Flint Northern boys track team won the Cross Country Class A State Championship. The team was led by Keith Young and Calvin McQueen. Young attended the University of Tennessee where he was an All-American. McQueen attended Saginaw Valley State where, he too, was named All-American. Norbert Badar served as the coach for 33 years. The 35th annual ceremony dinner honoring this year’s inductees will be held March 24, at the Genesys Conference and Banquet Center, 805 Health Park Blvd., Grand Blanc, MI. Tickets are $45 dollars. For tickets and information contact President, Mary Coleman at 810-659-4693 or GFAAHA Founder, Norm Bryant at 810-221-5948.